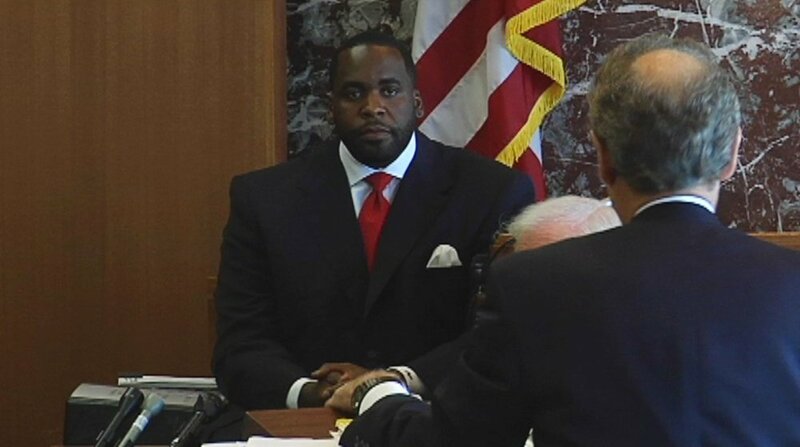 Mayor Kwame Kilpatrick testifies in Wayne County Circuit Court. In a civil lawsuit, Gary Brown, the head of Internal Affairs at the Detroit Police Department, claimed that Kilpatrick had ruined his career as an act of retribution. Courtesy of the Detroit Free Press. Deputy Police Chief Gary Brown files a whistleblower suit against City Hall, alleging he was fired for investigating the long-rumored Manoogian Mansion party. Mayor Kwame Kilpatrick denies the accusations. But while he’s on the stand, he’s asked a surprising, seemingly unrelated question — one that just might bring him down. Mayor Kwame Kilpatrick at a press conference with Detroit Police Chief Jerry Oliver, center, and chief of staff Christine Beatty, left. When he became mayor in 2002, Kilpatrick broke with tradition to hire a police chief from out of town. Kilpatrick sought to reform the department, but his tenure as mayor was more often marked by controversy surrounding the police officers on his security staff. Courtesy of Jerry Oliver. Attorney Michael Stefani and former deputy chief Gary Brown look over memos written by Brown to Police Chief Jerry Oliver. 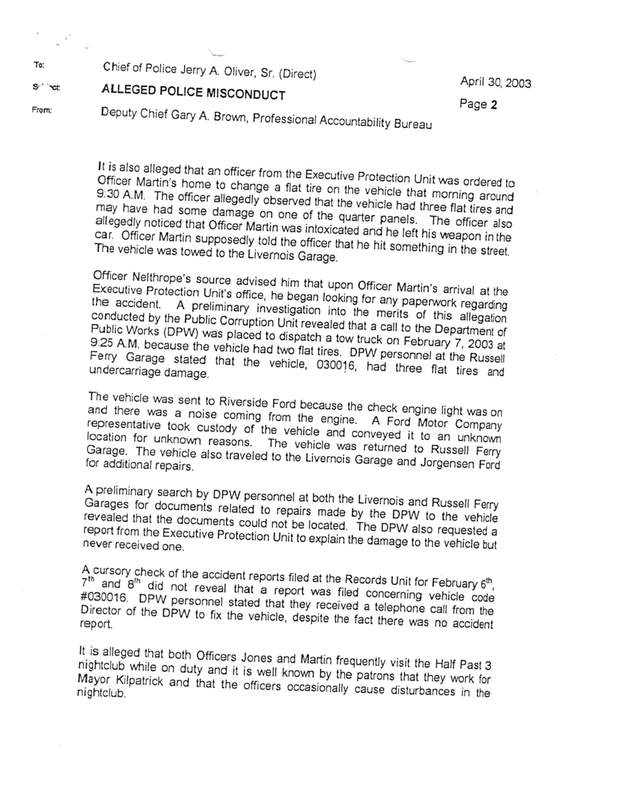 The memos detailed Internal Affairs allegations against the mayor, his family, and his security team. The Kilpatrick administration claimed it had only received a two-page memo (left), which concluded that no further investigation into the mayor’s security staff was needed. 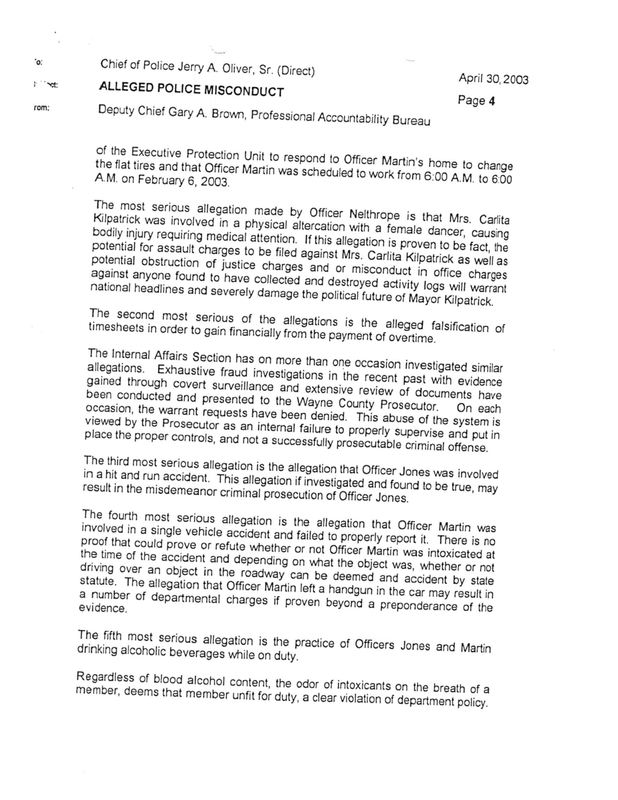 But Brown alleged that Kilpatrick and Oliver had also received a longer, five-page version of the memo (below), which explicitly mentions the Manoogian Mansion party allegation. Courtesy of the Detroit Free Press. Former police chief Jerry Oliver testifies in the whistleblower case against the city and mayor. Oliver initially did not agree with the mayor’s decision to remove Gary Brown as head of Internal Affairs. Oliver says that when he asked for a reason for the demotion, the mayor declined to tell him. Courtesy of the Detroit Free Press. A note from the foreman indicating that the jury was ready to deliver their verdict. They returned a unanimous decision in favor of Gary Brown and Harold Nelthrope, another police officer who was a source in the Internal Affairs investigation of the mayor. Nelthrope had also sued for damages as part of the lawsuit. Crimetown is Marc Smerling and Zac Stuart-Pontier. This season is made in partnership with Gimlet Media and Spotify. This episode was produced by Rob Szypko, John White, Soraya Shockley, and Samantha Lee. The senior producer is Drew Nelles. Editing by Zac Stuart-Pontier and Marc Smerling. Fact-checking by Jennifer Blackman. This episode was mixed, sound designed, and scored by Sam Bair. Original music this season composed by Homer Steinweiss. We recorded some original music at Rustbelt Studios in Detroit in partnership with Detroit Sound Conservancy. Special thanks to Carleton Gholz and Maurice “Pirahnahead” Herd. Additional music by John Kusiak, Kenny Kusiak, and Jon Ivans. Additional mixing by Bobby Lord. Our theme song is “Politicians In My Eyes” by Death. Our credit music this week is “Why Can’t We Communicate” by Melvin Davis. Archival research by Brennan Rees. 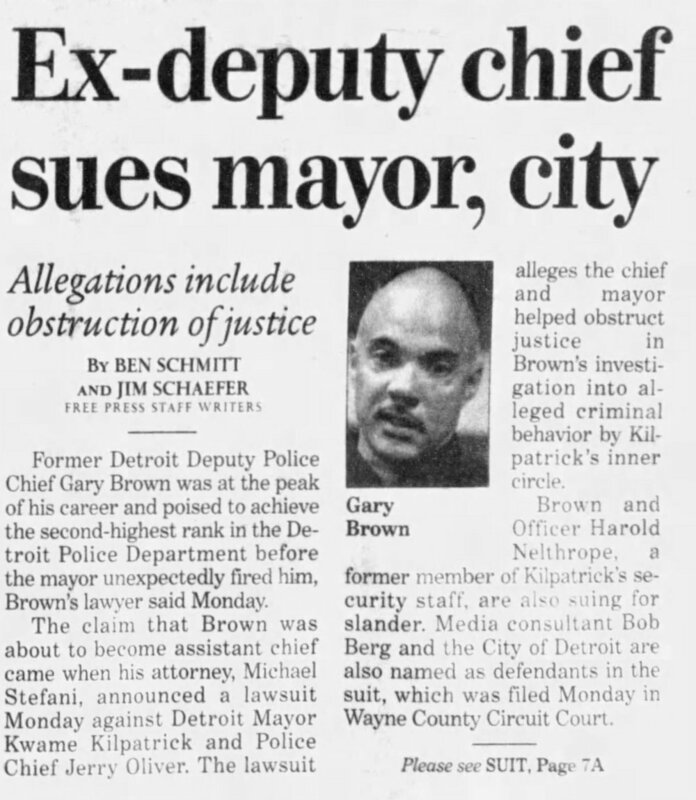 The trial recordings you heard in this episode are courtesy of Jim Schaefer and the Detroit Free Press. Jim and his reporting partner M.L. Elrick put together a book called “The Kwame Sutra.” Check it out — the proceeds go to charity. Archival material courtesy of the Walter P. Reuther Library at Wayne State University. Show art and design by James Cabrera and Elise Harven. Thanks to the Detroit Free Press, Peter Bhatia, Mary Schroeder, Melanie Maxwell, Mary Wallace, Max White, Randy Lundquist, Erick Hetherington at D&D Video, M.L. Elrick, Devin Scillian, Melissa Samson, the Charles H. Wright Museum of African-American History, the Detroit Historical Society, Brendan Roney, Mike Martin, Zak Rosen, Elizabeth Clemens, and everyone who shared their stories with us. Detroit’s an amazing place, and we’re honored to tell a small part of its story.